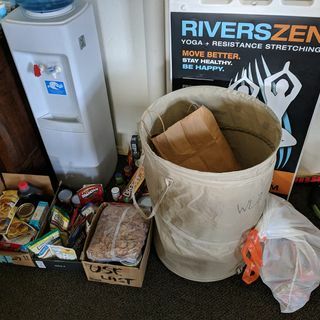 The news of the day: Wow, I shared yesterday that both RiversZen studios were drop off locations for the Be the Light Food Pantry collecting food and essential living items for the Coast Guard and furloughed government employees. Today’s photo is what happened within hours yesterday morning. Thank you so much to The Pacific Northwest Community Drum Circle and our members for stepping up so quickly. We will ... See More continue to collect those items for the next two weeks. Here is the link sharing the recommended items and the contact information for the Be the Light Food Pantry. https://www.thecoastievoice.com/be-the-light-food-pantry Thank you again.